*This casserole, like pizza, can be customized with your favorite toppings. 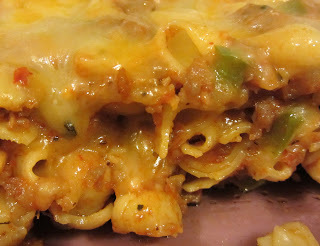 Add mushrooms, olives, bacon crumbles; substitute different cheeses - make it how you like it! *This recipe can be prepared ahead of time through Step 10. Cover tightly with plastic wrap and chill until ready to cook. You will have to add extra cooking time. 2. Combine the Parmesan, garlic, oregano, dried basil, marjoram, parsley, and pepper in a small bowl. Toss the ingredients together to blend. Set aside. 3. Bring a large pot of water to a boil. Add the salt and olive oil. Add the pasta and cook until just al dente (follow manufacturer instructions). Reserve 1/4 cup of the pasta water, set aside. Drain the pasta. Cover and set aside. 4. In the same pot, set over medium heat, add the butter. Cook, stirring constantly. When the butter smells nutty and appears golden brown, immediately transfer it to a small heat-proof bowl. Set aside. 5. In the same pot, set over medium heat, add the sausage. Cook, stirring and crumbling, until the sausage is cooked through. Transfer the sausage to a plate lined with paper towels to drain. 6. Return the pot to medium heat. Add the green peppers and onions. Cook, stirring occasionally, until the vegetables soften. Remove the pot from the heat. 7. Add the cooked sausage, Parmesan mixture, red pepper flakes, pepperoni, fresh basil, and salt to the pot. Mix well. 8. If you are using pizza sauce, add it to the meat mixture and blend well. If you are not using sauce, add 2 tbsp of the pasta water (or more as needed to keep the mixture moist). 9. Add the pasta and butter to the pot and mix well. 10. Pour half of the mixture into a 9" X 13" baking dish and spread into an even layer. Sprinkle half of the cheddar and mozzarella cheese evenly over the top. Pour the remaining pasta mixture into the dish and spread into an even layer. Sprinkle the remaining cheeses evenly over the top. 11. Bake for 15 minutes or until the cheese is melted and bubbly. 12. Let rest for 5 minutes. Cut and serve!